There is a new trend called “Dog Sharing” and I am trying to figure out whether it’s a good thing or a bad thing. Looks like it may have started in the UK but is catching on here in the states. I’ve been reading anything I can get my hands on about dog sharing and am having a hard time wrapping my head around it. It truly is what it sounds like – A dog is actually shared with two or more families. I’ll be honest, I am approaching this topic with a somewhat preconceived mindset. I apologize in advance. My gut reaction to dog sharing was a dropped jaw and an expletive. I don’t like the idea. So, if I appear biased in my delivery, you’ll know why, although I promise I will try to keep an open mind. Here’s how it works: A dog can be shared with an average of 2 – 3 families. The dog would stay at each family’s house for an agreed upon time, say 1 – 3 days. Both families equally share or will decide upon who will pay for the dog’s expenses: Vet visits, food, grooming, and supplies. Primarily in the UK, dog sharing is more of a “formal” arrangement. Sometimes agreements for sharing a dog between two homes are referred to as “joint custody”, or “Co-parenting”. Legal documents are signed by all parties, agreeing to the various facets of the dog’s ownership, clearly outlining who is responsible for what. Some sharing is more like “dog borrowing”: One family owns the dog, but another person would take the dog to their home on a regular schedule (Maybe most – if not every – day from noon till 10PM, for example) and provide love, exercise and socialization in their owner’s absence. This type of dog sharing does not include overnight visits. Another form of dog sharing is specifically designed for shelter pups. 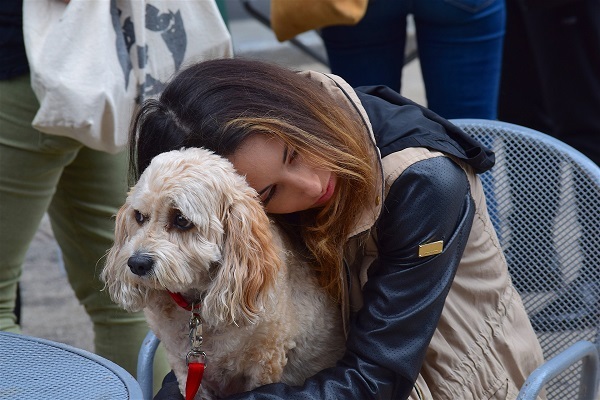 Shelters encourage people to take dogs from the shelter for various outings such as hiking, a trip to the beach, a sleepover, a holiday, or just a weekend away from the shelter. Is there a “good” to dog sharing? Maybe so (Gasp!). Sharing a shelter dog and some “dog borrowing” arrangements are a little easier to swallow, in my opinion. In fact, “sharing” a shelter dog seems like a good idea. If the “borrowers” are completely vetted as if they were adopting, thus assuring the dog’s safety, then why not? Sharing a shelter dog gets the dog out of the shelter for some fun and socialization and could lead to a permanent adoption. Dog “borrowing” could be a positive under the right circumstances. To me, dog borrowing is much like dog sitting. Busy dog owners finding part-time caregivers, but without having to pay a fee. Let’s suppose that someone works a 3-11 shift and is gone from the home every day from 2:00 on. A dog left alone during the best part of the day, 5 – 6 days a week, is not healthy. In this scenario, the dog probably thinks the “borrower” is a really good pal, but he understands that he has a home and a master. Therein lies my discord… home and master. A dog splitting time between homes doesn’t sit well with me. I believe a dog needs one home and one master. Why would anyone think upsetting the family or “pack” structure is a good idea? ‘Tis better to share than relinquish your dog when you can no longer care for it adequately – for whatever life throws at you. For every dog owner who is not able to care for their pet 24/7, there is a dog-lover out there who can’t – for many reasons – have a pet of their own and would love the opportunity to share in the life of a dog! Dog sharing can provide your dog with a known, trusted temporary “family” and “home” during times when you have to be away for a few days or longer. What’s wrong with sharing a dog? How can I defend the argument that a dog is better off being shared than sitting in a crate all day? I can’t, but I do believe there are better options. At Holiday Barn Pet Resorts, we meet that need every single day with activities and one-on-one time with pets whose parents are away at work. The resort environment in no way competes with the dog’s home environment. Dogs who play at Day Camp are fully socialized and well rounded, with the assuredness of knowing that at the end of the day they will return to the comfort and security of their home and their beloved human. Yes, day care has a cost involved… something you wouldn’t have to worry about in a dog-sharing plan. But it’s a small price to pay for its many advantages and the fun and confidence your dog gains from the experience. Dogs take great pleasure in having a home of their own. They are social creatures and want to be part of a pack. In order for them to have a well-balanced sense of association, dogs should have an established pack (family, household) and stability within that pack. An established pack promotes security. Pulling them away from their pack creates confusion and anxiety. And if one of the shared homes has other pets, introducing them to an already established pack could cause turmoil, and perhaps even aggression between them. Dogs like routine. My dog has everything on a schedule, and I’m sure you know what I’m talking about. When we take Rex out for his last potty break of the evening, he knows that after his walk, we go to bed. If we decide to stay up and watch some TV, he is appalled! Dogs structure their days. They want to know what to expect from their lives, and from their owners. Consistent feeding, walking, pottying, training, handling… these are important to a dog. Doesn’t it make sense that sharing would adversely impact a dog’s routine? As we discussed in “Moving with your Dog”, we realize that moving is upsetting and stressful for a dog. Most dogs are somewhat territorial, whether it’s aggressive or not. Their home is their turf. It’s safe and familiar. They have their favorite spots too; like that area right in front of the living room window that provides a perfect sun spot for them to lie; Or, that spot that they go to let you know that they want to go outside; then they’re introduced to something different and life doesn’t make sense anymore. Their entire world is in disarray! Sounds dramatic to us, but it’s very real to them. Just how would that work if the dog is repeatedly displaced? I think it would be very disconcerting to a dog, creating an enormous amount of anxiety. I also feel strongly that dogs are not “things” we pass around for our own convenience or amusement. They’re not toys. Obviously, dogs do not have the same rights and freedoms we have as humans, but it is up to us to look after their well-being. If we were to delve into detail, this blog would be a mile long… For instance, what about training? If one family had the dog professionally trained, how can they expect all the families to enforce that training? And what if one family feels particularly adamant that a dog is not fed scraps from the table, yet another family thinks its no big deal? One family may let the dog on the couch and bed, and the other family prohibits that. We could go on and on! That poor dog! What a miserable, anxiety-ridden life they would lead. And, oh, It smells different at other houses. Just saying! We all know smell is important to a dog. Their home has familiar and comforting smells. It has to smell like “home”, right? We are interested in your thoughts on Dog Sharing. Do you think it is a positive thing? Would you share your dog with another family? Let us know! Error: Error validating access token: Session has expired on Monday, 29-Oct-18 09:08:51 PDT. The current time is Thursday, 18-Apr-19 19:36:43 PDT.